Coming out as bisexual can be a difficult thing to do. We have to deal with a range of fears, including fear of rejection, fear of embarrassment and fear of being misunderstood. While such fears are often unavoidable, if we get overwhelmed by fear then we can communicate poorly, making it hard for the person we’re coming out to to understand what we’re trying to say. That’s why it’s worth thinking carefully through how you will come out, and making a basic plan to guide you, so that you don’t get thrown off course by your nerves. There are many ways that you could come out, and you’ll probably want to stamp your individuality onto the guide below. The guide lays out some general principles which I hope will lay a foundation from which you can design a way of coming out which suits you and your personality. Your backstory and current experience are unique to you, so be true to yourself and personalise your coming out in whatever way makes sense to you. Most of the people we want to come out to, at least at first, will be the important people in our lives, such as partners, family and friends. This guide might not therefore be so appropriate if you are coming out to a work colleague or acquaintance. However, many of the general principles in the guide could be applied to any coming out situation. Anxiety is a normal reaction to the idea and process of coming out. We might be afraid of rejection, misunderstanding, embarrassment, or prejudice among other things. Accepting these nerves as unavoidable is crucial. Anxiety doesn’t feel good, but it won’t harm you, and will subside shortly, especially after you’ve overcome the hurdle of actually saying, ‘I’m bisexual’. Just let the fear be there, accept that it’s normal and inevitable. It may help to reimagine the anxiety as a positive force that’s pushing you to come out, that’s wanting you to do something that will free you and make your life better. It’s important that there’s plenty of time and space to talk after you have revealed your bisexuality. Choosing a private, calm and preferably familiar environment is sensible, so that the conditions are optimal for a relaxed conversation. If you prefer a coffee shop or another relaxed public venue, and you think the person you’re talking to will feel comfortable there, then that could work too. Try to avoid times when you know the person you’re wanting to come out to may be stressed – ie. just before or just after work. Likewise, if they’re dealing with a particular stress or worry at a given time, then you might want to wait for another time when they are more relaxed before coming out to them. Being open is important as it helps the other person understand your bisexuality better. If they have any prejudices or faulty beliefs about bisexuality, then these will persist unless you can help them understand things differently, by explaining your bisexuality to them clearly. It would be natural for the person you’re coming out to to have questions. Be open to those questions, and make it clear that you’re happy to be asked and to share your experience. This will establish that bisexuality is not a ‘sensitive’ topic which should be avoided, but a normal and interesting part of life, and something they can safely show an interest in in the future. Be straightforward in your word choice and descriptions so that it’s clear what you are communicating. Having an idea in advance of precisely how you’ll break the news can be very helpful, so that you don’t get overcome by nerves and find yourself rambling. You could write down some ideas of what you want to say, and even memorise a few words or phrases that you’d like to include. Coming out is primarily something you do to improve your own wellbeing, but it can also help us build a better relationship with someone else. Coming out is about wanting to involve another person more deeply in your life and experience. It’s about trust and intimacy and love, and enhancing all of these things. So, if it makes sense to you, let the person know in your own way that they are important to you. Doing so will also help put the person at ease, and underline the need for them to respond in a loving and considerate way to what you are telling them. For most people, coming out to the important people in their lives goes much more smoothly than they feared it might. This is because the people we are close to usually love us very much and want us to feel happy and free in our lives. Seeing us anxious or unhappy makes them unhappy too. Even if they find what you are telling them emotionally difficult, they will try to make you feel at ease and want to help and accept you. However, sometimes we have to deal with a negative reaction from someone who we are close to, even if they are broadly kind and sympathetic towards us. Even generally sensitive and decent people can hold some biphobic or homophobic beliefs. If any such beliefs are expressed when you come out, it can be helpful to gently and calmly explain that those beliefs aren’t accurate. Explaining the facts and true nature of bisexuality to others can transform their beliefs, which they have often arrived at not by rational thought, but by absorbing them from the wider society. Biphobic and homophobic beliefs can also quickly wither away when someone realises that a person they love is bisexual. Many times, casually held prejudicial beliefs are quickly reversed when someone is confronted with a bisexual person in their family or friendship circle. You may even find that those who held such beliefs become your greatest supporters and champions. Sometimes, sadly, biphobic and homophobic beliefs endure for longer. When this is the case, we need to give a person holding such beliefs some time and space to reflect. When you come out, if the person’s negative beliefs show no sign of changing during your conversation, then it’s probably better not to argue the point too much straight away. Give them time to go away and consider what you have told them. With continuing engagement with you as an ‘out’ bisexual person, they may come to abandon their beliefs over time. Even if they cling on to those beliefs, this doesn’t mean that you can’t have a valuable relationship with that person, although it may prove challenging to tolerate their views, especially if they are keen to express them. 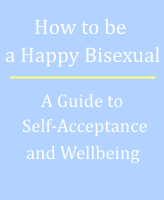 This blog post is an edited extract from my book ‘How to be a Happy Bisexual: A Guide to Self-Acceptance and Wellbeing’ available here.